National Academy of Engineering member Maria Flytzani-Stephanopoulos will give the 2019 Ensor Lecture, Monday, Feb. 25, on the WSU Pullman campus. A 3 p.m. reception in the Spark Town Square will precede her lecture, titled, “The Changing Landscape of Heterogeneous Catalysts: Single Metal Atoms as Game‑Changers,” slated for 4 p.m. in Spark G45. 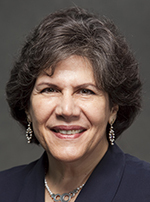 Maria Flytzani-Stephanopoulos is a Distinguished Professor and the Robert and Marcy Haber Endowed Professor in Energy Sustainability in the School of Engineering at Tufts University. She directs the Tufts Nano Catalysis and Energy Laboratory, which investigates new catalyst materials for efficient and clean production of hydrogen and chemicals. Pioneering work from her lab has demonstrated the use of single‑atom heterogeneous catalysts for several reactions of interest to fuels and chemicals processing. These catalysts — with 100 percent atomic efficiency of precious metals and high selectivity to the desired product — will enable more efficient and sustainable chemical process development. Flytzani-Stephanopoulos holds 10 patents and has written more than 170 technical papers. She has been an editor of the journal Applied Catalysis B: Environmental since 2002, and is an associate editor of Science Advances. She is the recipient of many awards and distinctions, including the Tufts Distinguished Scholar Award, the Henry J. Albert Award of the International Precious Metals Institute (IPMI), the Giuseppe Parravano Memorial Award of the Michigan Catalysis Society, the Graduate Teaching and Mentoring Award of the Tufts School of Engineering, and the Carol Tyler Award of the IPMI. Flytzani-Stephanopoulos holds honorary professorships at Tianjin University and the Beijing University of Chemical Technology, is a Fellow of the AAAS and the AIChE, and a member of the US National Academy of Engineering. The Ensor Lecture in the Gene and Linda Voiland School of Chemical Engineering and Bioengineering was established in 2016 to encourage communication and collaboration on emerging ideas in any area related to chemical engineering, bioengineering, aerosol technology and nanotechnology. David Ensor (’63, chemical engineering) and his wife, Sara, established the lectureship as a reflection of their deep interest in higher education and their strongly held belief in the empowerment that education provides for one’s life.